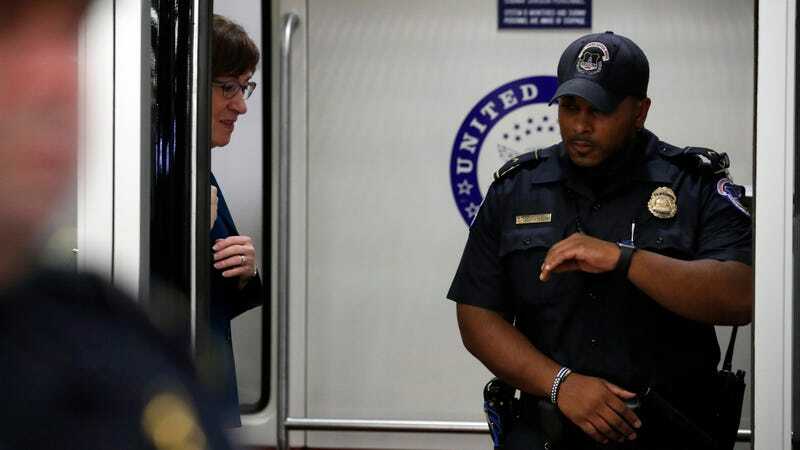 Sen. Susan Collins, R-Maine, stands in a Senate subway car with a Capitol Hill Police officer, on Capitol Hill, Wednesday, Oct. 3, 2018 in Washington. The U.S. Capitol Police on Wednesday announced the arrest of a suspect accused in the online doxing of “one or more” U.S. senators. Capitol Police identified the suspect as Jackson A. Cosko, a 27-year-old of Washington, D.C. The police did not indicate which U.S. senator—or potentially senators—the suspect is accused of doxing. Cosko is as former Senate Democratic staffer, who, at the time of the incident, worked as an intern for Rep. Sheila Jackson Lee, Democrat of Texas, according to Politico. He was reportedly fired following his arrest. Last week, personal information belonging to multiple GOP lawmakers, including Senators Mike Lee, Lindsey Graham, and Orin Hatch, appeared on their respective Wikipedia pages. The pages were edited to include the lawmakers’ home address, and multiple phone numbers, including private cellphone numbers. The Capitol Police investigation was first reported by Gizmodo on Thursday. The three lawmakers are supporters of Supreme Court nominee Brett Kavanaugh and were hearing his testimony, along with that of Dr. Christine Blasey Ford—one of the women accusing him of sexual misconduct—at the time their information was published. On Monday, similar details were posted on Wikipedia belonging to Senate Majority Leader Mitch McConnell and Senator Rand Paul, though the perpetrator responsible, who was also using an IP address linked to the U.S. House of Representatives, claimed to be a different person. In both cases, most of the information was already public, including at least some of the home-state addresses, which were listed on various campaign forms. Republican aides confirmed as genuine, however, other details that were not publicly known, such as two private cellphone numbers published in last week’s dox. The senators’ information circulated widely on Twitter as well, thanks, in part, to a bot that retweets screenshots of Wikipedia pages edited from IP addresses assigned to the U.S. House of Representatives. The bot, CongressEdits, has been suspended by Twitter. Cosko has been charged for now with making restricted information public, making threats in interstate communications, unauthorized access to a government computer, identity theft, second-degree burglary, and witness tampering. The investigation is ongoing and further charges may be coming, police said. Cosko graduated from George Washington University in 2014 and previously worked for Democratic Sens. Maggie Hassan of New Hampshire and California’s Barbara Boxer, who has since retired. Cosko most recently worked for Hassan as a “legislative correspondent/systems administrator,” according to Legistorm.